Looking for a great deal on a hotel near Henderson Events Plaza and Amphitheatre? Then Orbitz is the only place to book! Not only is Henderson Events Plaza and Amphitheatre a major attraction, but Henderson also has so much to offer travelers. On top of plenty of great places to stay, there are other attractions to visit in Henderson when you’re done at Henderson Events Plaza and Amphitheatre. Book your vacation to Henderson Events Plaza and Amphitheatre with Orbitz for a trip you won’t soon forget. When it comes to finding hotels near Henderson Events Plaza and Amphitheatre, an Orbitz specialist can help you find the right property for you. Chat live or call 1-800-454-3743 any time for help booking your hotels near Henderson Events Plaza and Amphitheatre. Our team of experts can help you pinpoint Henderson hotel options suited to your tastes and budget. On Orbitz, Henderson hotel deals mean flexibility. If you need to change your Henderson Events Plaza and Amphitheatre hotel reservations, or cancel your stay, Orbitz doesn't charge cancel or change fees. Orbitz also offers great selection on airline tickets, vacation packages, and car rental deals to so you can plan your trip all in one place. Are there hotels with free wifi near Henderson Events Plaza and Amphitheatre? Definitely. After a long day out in Henderson at Henderson Events Plaza and Amphitheatre, it’s nice to come back and relax at your hotel knowing they have free wifi. Binge on your favorite online show, or check the weather forecast and plan your activities for the next day. Either way, hotels near Henderson Events Plaza and Amphitheatre with free wifi are the best option for your trip. Instead of scouring the web to find all the Henderson hotels with free wifi, browse our listings of the best hotels offering free wifi near Henderson Events Plaza and Amphitheatre. Green Valley Ranch Resort and Spa has rooms. It is a 4.50 star rated hotel that offers free wifi. Tropicana Las Vegas - a DoubleTree by Hilton Hotel has rooms. It is a 4.00 star rated hotel that offers free wifi. MGM Grand Hotel & Casino has rooms. It is a 4.00 star rated hotel that offers free wifi. Sam's Town Hotel & Gambling Hall has rooms. It is a 3.50 star rated hotel that offers free wifi. Can I book hotels near Henderson Events Plaza and Amphitheatre with free breakfast? This hotel is located 11.8 miles away from Henderson Events Plaza and Amphitheatre. The hotel offers free breakfast and has a 4.00 star rating. Book New York-New York Hotel & Casino now! This hotel is located 11.7 miles away from Henderson Events Plaza and Amphitheatre. The hotel offers free breakfast and has a 3.00 star rating. Book Excalibur Hotel Casino now! This hotel is located 11.2 miles away from Henderson Events Plaza and Amphitheatre. The hotel offers free breakfast and has a 3.00 star rating. Book Silver Sevens Hotel & Casino now! 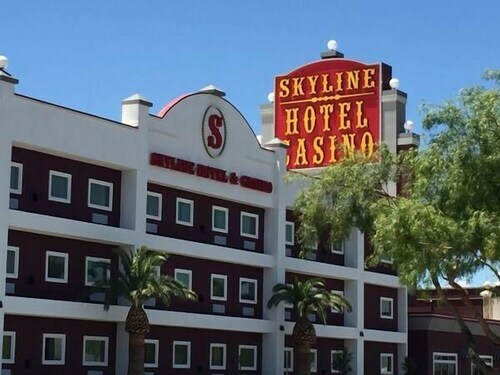 This hotel is located 11.1 miles away from Henderson Events Plaza and Amphitheatre. The hotel offers free breakfast and has a 3.00 star rating. Book Alexis Park All Suite Resort now! Are there pet-friendly hotels near Henderson Events Plaza and Amphitheatre? Yes, there are. Don’t want to leave the pups behind on your trip to Henderson? You don’t have to! At Orbitz, we know no trip is complete without man’s best friend. That’s why we’ve found these awesome hotels near Henderson Events Plaza and Amphitheatre that allow pets. Park MGM Las Vegas is a pet-friendly hotel near Henderson Events Plaza and Amphitheatre that has a 4.00 star rating. The hotel is located only 11.8 from Henderson Events Plaza and Amphitheatre. Delano Las Vegas at Mandalay Bay is a pet-friendly hotel near Henderson Events Plaza and Amphitheatre that has a 5.00 star rating. The hotel is located only 11.5 from Henderson Events Plaza and Amphitheatre. Mandalay Bay Resort And Casino is a pet-friendly hotel near Henderson Events Plaza and Amphitheatre that has a 4.00 star rating. The hotel is located only 11.5 from Henderson Events Plaza and Amphitheatre. ARIA Resort & Casino is a pet-friendly hotel near Henderson Events Plaza and Amphitheatre that has a 5.00 star rating. The hotel is located only 11.9 from Henderson Events Plaza and Amphitheatre. Where can I find hotels near Henderson Events Plaza and Amphitheatre with restaurants? Although it’s fun to taste the local cuisine on your trip to visit Henderson Events Plaza and Amphitheatre, sometimes it’s nice not to worry about what’s for dinner or where to go. 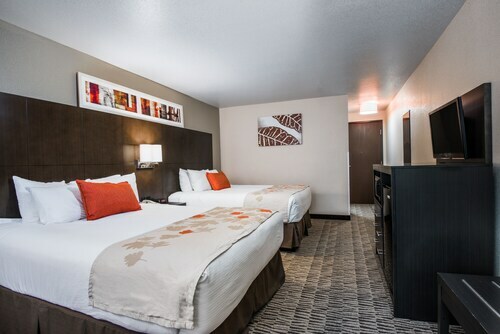 Our hotels with restaurants in Henderson will allow you to just lay low after a day of exploring Henderson Events Plaza and Amphitheatre and enjoy a great meal without leaving the comfort of your hotel. Book Tuscany Suites & Casino. This is a 3.00 star hotel with a restaurant. The hotel is located 11.6 from Henderson Events Plaza and Amphitheatre. Book Luxury Suites International At The Signature. This is a 4.50 star hotel with a restaurant. The hotel is located 11.6 from Henderson Events Plaza and Amphitheatre. Book Luxor Hotel and Casino. This is a 3.50 star hotel with a restaurant. The hotel is located 11.6 from Henderson Events Plaza and Amphitheatre. Book Mandarin Oriental- Las Vegas. This is a 5.00 star hotel with a restaurant. The hotel is located 11.9 from Henderson Events Plaza and Amphitheatre. What are the best deals on Henderson Events Plaza and Amphitheatre hotels with pools? If you want to cool off in the pool after a great day out in Henderson exploring Henderson Events Plaza and Amphitheatre, our deals are just what you need. We offer discount rates on the top hotels near Henderson Events Plaza and Amphitheatre that have pools. Bally's Las Vegas - Hotel & Casino is a 4.00 star hotel with a pool that’s located 12.1 from Henderson Events Plaza and Amphitheatre. Wynn Las Vegas is a 5.00 star hotel with a pool that’s located 12.3 from Henderson Events Plaza and Amphitheatre. The Westin Las Vegas Hotel & Spa is a 4.00 star hotel with a pool that’s located 11.8 from Henderson Events Plaza and Amphitheatre. Caesars Palace - Resort & Casino is a 4.50 star hotel with a pool that’s located 12.2 from Henderson Events Plaza and Amphitheatre. Are there hotels near Henderson Events Plaza and Amphitheatre with parking? If you’re planning to drive around Henderson, or if you want to leave your car somewhere safe to walk from your hotel to Henderson Events Plaza and Amphitheatre, you’ll want to check out our deals on hotels near Henderson Events Plaza and Amphitheatre with parking. We've found deals on bookings for hotels near Henderson Events Plaza and Amphitheatre that have parking on-site for guests. Westgate Las Vegas Resort & Casino has a 4.00 star rating and offers parking for guests. Located just 12.1 from Henderson Events Plaza and Amphitheatre, this hotel is a steal. Four Seasons Hotel Las Vegas has a 5.00 star rating and offers parking for guests. Located just 11.4 from Henderson Events Plaza and Amphitheatre, this hotel is a steal. Paris Las Vegas Resort & Casino has a 4.00 star rating and offers parking for guests. Located just 12 from Henderson Events Plaza and Amphitheatre, this hotel is a steal. Jet Luxury at the Vdara Condo Hotel has a 5.00 star rating and offers parking for guests. Located just 12.2 from Henderson Events Plaza and Amphitheatre, this hotel is a steal. Is there 24-hour concierge service at Henderson Events Plaza and Amphitheatre hotels? Sometimes travel can be unpredictable. Maybe your flight gets delayed and you miss check-in time, or you decide to stay late at Henderson Events Plaza and Amphitheatre and return after the front desk is closed. Either way, you don’t want to get stuck without 24-hour concierge services at your hotel near Henderson Events Plaza and Amphitheatre. Try Mirage Resort & Casino This hotel has a 4.00 star rating, 24 hour concierge, and is located only 12.3 from Henderson Events Plaza and Amphitheatre. Try Polo Towers by Diamond Resorts This hotel has a 3.50 star rating, 24 hour concierge, and is located only 11.9 from Henderson Events Plaza and Amphitheatre. Try Cancun Resort by Diamond Resorts This hotel has a 3.00 star rating, 24 hour concierge, and is located only 10.7 from Henderson Events Plaza and Amphitheatre. Try The Cosmopolitan Of Las Vegas This hotel has a 5.00 star rating, 24 hour concierge, and is located only 12 from Henderson Events Plaza and Amphitheatre. Can I book a hotel near Henderson Events Plaza and Amphitheatre with non-smoking rooms? Sometimes it’s nice to explore a new area on foot to really get a feel for the lay of the land. Explore Henderson like a local and stay within walking distance of Henderson Events Plaza and Amphitheatre without going over budget. Planet Hollywood Resort & Casino is only 12 away from Henderson Events Plaza and Amphitheatre and offers non-smoking rooms. Bellagio is only 12 away from Henderson Events Plaza and Amphitheatre and offers non-smoking rooms. The LINQ Hotel & Casino is only 12.2 away from Henderson Events Plaza and Amphitheatre and offers non-smoking rooms. The Palazzo Las Vegas is only 12.3 away from Henderson Events Plaza and Amphitheatre and offers non-smoking rooms. What are the top 5-star hotels near Henderson Events Plaza and Amphitheatre? If you’re interested in 5-star hotels near Henderson Events Plaza and Amphitheatre, there are 12 to choose from. To help you narrow down your search, we’ve pulled together some of the best deals for you. The Venetian Las Vegas: is a 5.00 star hotel that's only 12.3 from Henderson Events Plaza and Amphitheatre. Bellagio: is a 5.00 star hotel that's only 12 from Henderson Events Plaza and Amphitheatre. The Cosmopolitan Of Las Vegas: is a 5.00 star hotel that's only 12 from Henderson Events Plaza and Amphitheatre. The Palazzo Las Vegas: is a 5.00 star hotel that's only 12.3 from Henderson Events Plaza and Amphitheatre. Where can I book 4-star hotels close to Henderson Events Plaza and Amphitheatre? MGM Grand Hotel & Casino is a 4.00 star hotel that is only 11.7 away from Henderson Events Plaza and Amphitheatre. TI - Treasure Island Hotel and Casino is a 4.00 star hotel that is only 12.3 away from Henderson Events Plaza and Amphitheatre. 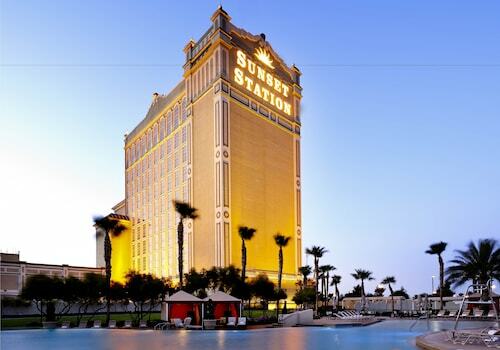 Mandalay Bay Resort And Casino is a 4.00 star hotel that is only 11.5 away from Henderson Events Plaza and Amphitheatre. Park MGM Las Vegas is a 4.00 star hotel that is only 11.8 away from Henderson Events Plaza and Amphitheatre. What are the cheapest 3-star hotels near Henderson Events Plaza and Amphitheatre? Looking to save a little cash on your trip to visit Henderson Events Plaza and Amphitheatre? We get it. You want to splurge on outings and activities, without blowing your budget on hotel rooms. Our 3-star hotels are perfect for a budget-friendly trip to explore Henderson and check out Henderson Events Plaza and Amphitheatre. Browse our best deals on 3-star hotels near Henderson Events Plaza and Amphitheatre below. Luxor Hotel and Casino is located just 11.6 away from Henderson Events Plaza and Amphitheatre and has a 3.50 star rating. Excalibur Hotel Casino is located just 11.7 away from Henderson Events Plaza and Amphitheatre and has a 3.00 star rating. Flamingo Las Vegas - Hotel & Casino is located just 12.2 away from Henderson Events Plaza and Amphitheatre and has a 3.50 star rating. Harrah's Hotel and Casino Las Vegas is located just 12.3 away from Henderson Events Plaza and Amphitheatre and has a 3.50 star rating. 1 week ago by A verified traveler from Bastrop TX.